An overflowing crowd fills the Cache County Council chamber, awaiting a vote on whether the council will adopt a resolution to authorize eminent domain proceedings on Davenport Road. 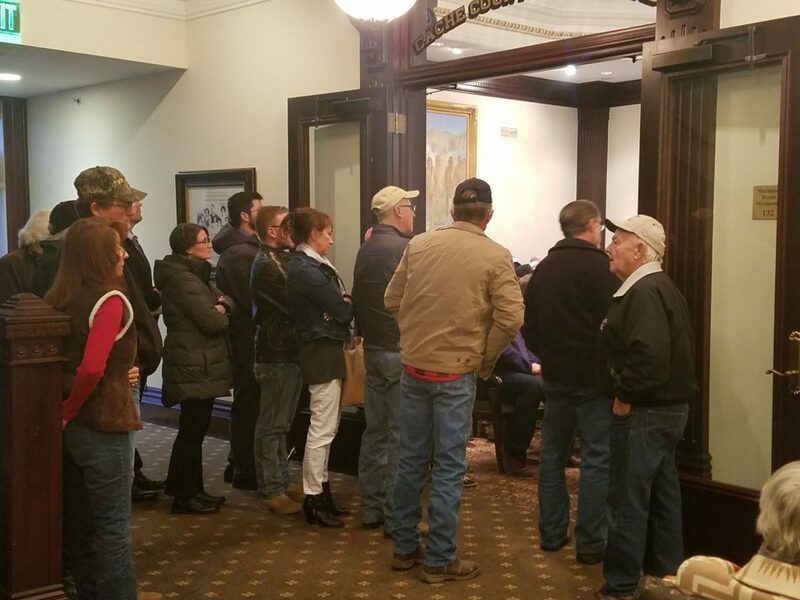 The Cache County Council chamber was filled beyond overflowing on Tuesday as the council prepared to vote on whether to approve a resolution (Resolution 2016-30) to authorize eminent domain proceedings on Davenport Road near Avon. Several attendees holding signs that read “Vote No on Eminent Domain” were asked to put the signs away. The debate concerning Davenport Road has been ongoing for more than six years, involving litigation related to whether or not Davenport Road, located within the privately-owned Four Mile Ranch, is a public road and whether restricting access to it infringes on the ability of surrounding landowners to access private land. As a preface to the decision-making discussion, remarks included a procedural explanation of eminent domain, analysis of the environmental impact of improvements to the road, and a recommendation to grant the owners of Four Mile Ranch a second appraisal to determine fair market value of the five-mile stretch of road. Conversation throughout the meeting likewise involved the county’s longer-term intentions for the road, including the possibilities of development and recreational use. Scott Samples, co-owner of Four Mile Ranch, was also given an opportunity to speak. While representatives of Four Mile Ranch maintain that Davenport Road has been considered a private road since 1862, Edwards presented an 1877 United States Surveyor Map indicating otherwise. Edwards likewise referred to a 1929 Utah Supreme Court Case decision affirming Davenport Road’s public use. Prior to voting on the resolution, several members of the council expressed their reticence to exercising eminent domain, while at the same time indicating that their votes would be driven by a belief that the road was indeed public. Amid applause from the audience, White went on to assert that his grandfather had driven the first wagon down Davenport Road and, as a landowner himself, he did not agree with the condemnation of the road. With a final vote of 6-1, the Cache County Council ended the discussion with approval of the resolution to exercise eminent domain on Davenport Road. Tim Rawlings, a Preston resident, has been following the Davenport Road controversy for five years. “The law was upheld tonight, truth and justice prevailed, and I think the county did the right thing,” he said. Chris Mortensen, who lives in Avon, disagrees. Summarizing its position, the Cache County Council issued a news release late Tuesday. 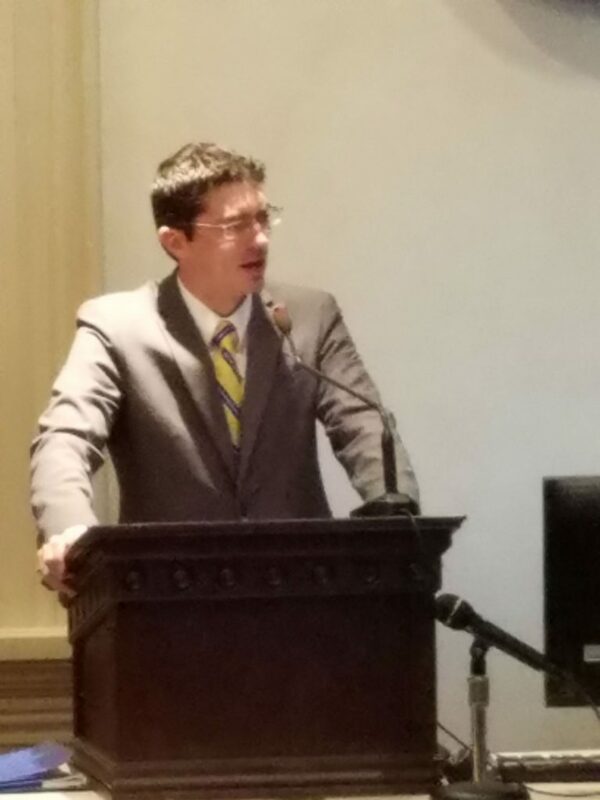 Logan attorney Seth J. Tait presents Four Mile Ranch's argument opposing eminent domain proceedings on Davenport Road. An overflowing crowd gathers to hear the Cache County Council's final deliberations related to exercising eminent domain on Davenport Road.